Following the short-lived paralysis triggered by Donald Trump’s presidential victory, commentators began to explain the results in terms of critical cultural divisions that quite often were neatly correlated with a geographical urban-rural split. Large, diverse, cosmopolitan cities sided with the Democrats; largely white, rural and exurban areas tended towards the Republicans. It was a narrative that sounded strangely familiar following the UK’s vote to leave the EU earlier in the same year. Amidst the analysis of similarities between Trump and Brexit, differences in demographic and socioeconomic patterns were often obscured, most notably that the vote to leave the EU was far more significantly associated with older, less educated voters of a lower social class, especially in England and Wales* (contrast EU referendum with Trump election). These findings have given rise to a whole raft of mainstream media and academic articles describing this population and the places they live as ‘left behind’ from a globalised economic structure and separate from an increasingly ‘cosmopolitan’ city-based culture. But what is actually meant when describing a place as left behind? How does it associate with the Brexit vote? How does geography fit into any definition of ‘left behindedness’? And is it patronising to talk of places as being left behind? Countless newspaper articles have sought explanations for Brexit in the “the loss of close, industrial communities” and the “devastated communities throughout industrial England” that seemingly consist of a left behind population. The idea is that, as larger cities have made impressive economic and educational advancements, their populations have forgotten to look back over their shoulders at smaller, struggling towns, many of which have been so since Thatcher stripped them of their industries (whilst financialising London) in the name of cheaper products and labour from abroad. A rift has developed between cities with a significant young, highly-skilled, ethnically diverse and well-educated population (think London, Cambridge or Manchester) and towns or small cities with a largely older, white, less well-educated population (think Stoke-on-Trent, Rotherham and Hull). These demographic divisions are supposedly neatly aligned with attitudinal differences: cosmopolitan cities whose predominantly socially liberal populations are comfortable with ethnic diversity and immigration, in contrast with left behind towns marked by disaffection with mainstream politics and a growing embrace of authoritarianism and anti-immigrant populism. In their demographic, socioeconomic and political characteristics, these cosmopolitan places could be referred to as ‘like-London’ and the left behind as ‘unlike-London’. 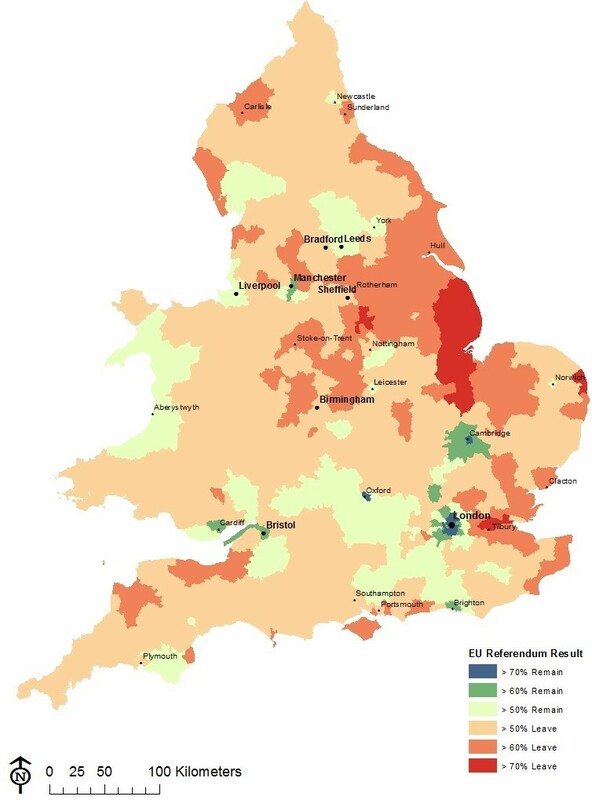 The map of the Brexit vote below is suggestive of this pattern: every inner-city area of London voted strongly to remain in the EU, alongside prospering Southern cities – Oxford, Cambridge and Brighton. Many larger, vibrant and reasonably ethnically diverse cities went the same way – Bristol, Liverpool, Manchester and Leeds. In contrast, the vote to leave was more widespread, though strongly associated with smaller cities with low educational levels (Southampton, Portsmouth), struggling coastal towns (Clacton) and de-industrialised towns across the North and Midlands (Rotherham, Hull, Sunderland and Stoke-on-Trent). Eu Referendum Result by Local Authority, England and Wales. Source: Author. The map also reveals the potential for an electoral cleavage to exist between places that are closely connected to London and places that are far removed from London. The vote to remain was strongest in the South East, in an almost radial pattern from London towards Cambridge (northwards), Oxford (westwards), Southampton (south-westwards) and Brighton (southwards). This covers some of the wealthiest, most educated areas of the UK, where vast numbers of people commute into London by train. A monocephalic vision of Britain is suggested, in which the ‘primate city’ of London occupies the centre of a core region (the South East). As one moves further away from this core region towards more peripheral areas in the North, Scotland and Wales, the economic, cultural and political connectedness to London inevitably declines. 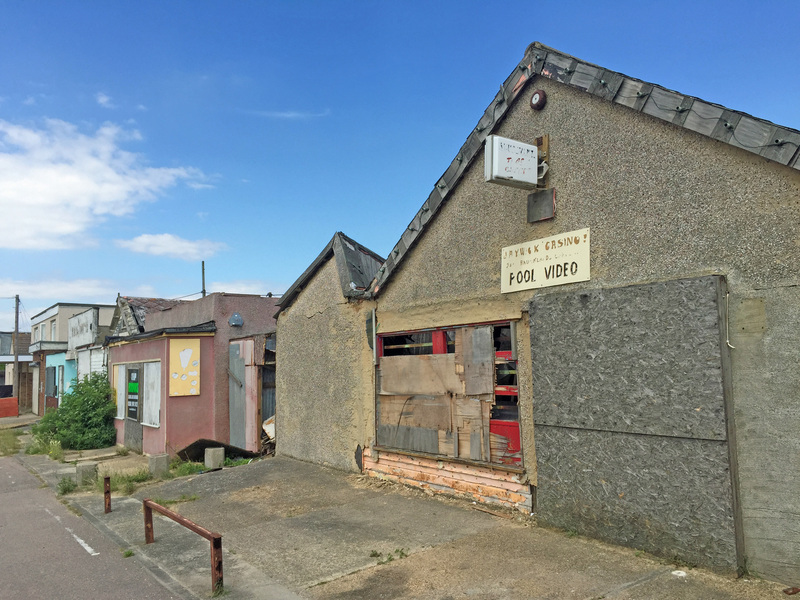 Due to London’s dominance, towns that exist in the periphery – particularly those further away from larger, more ‘Londonised’ cities, are likely to become left behind and possibly more susceptible to right-wing populism. This geodemographic-political alignment is far from clear-cut: it is both demeaning and incorrect to characterise largely working-class, deindustrialised northern towns in particular as comprising a homogeneous “left behind army” who are “inherently the natural voting fodder for right-wing populism”. UKIP have largely struggled to gain a foothold in the North West for example, where the supposedly ideal socioeconomic (relatively poor) and demographic conditions (largely white, old) exist. Furthermore, support for Brexit and UKIP has been considerably higher in areas of Essex – directly east of London – than in somewhat deprived towns, such as Clacton and Tilbury, that have grown from the in-migration of London’s white working-class and can hardly be considered the ‘core’ of the UK. A recent article about Tilbury, located only 40 minutes by train from London, paints an especially sad picture: “most residents of the town, one of England’s poorest places, are as likely to commute to the capital as fly to the moon”. Being close and well connected to a cosmopolitan centre means very little to many residents who, due to socioeconomic, educational or mobility barriers, are unable to access London’s incalculable opportunities. Stories that come out of places such as Tilbury are hardly extraordinary. Indeed, I can recall a couple of experiences of my own and of those around me. The first is my mum leaving her home city of Stoke-on-Trent (pictured below) aged sixteen (“I had to get out”) and being almost the only person before or since in her family to do so. Then, last year, on a pub crawl in a Greater Manchester town (Radcliffe), I was more than once asked, “What are you doing here? You can’t be from around here. You look like a university student”, despite only living four kilometres down the tram tracks towards Manchester. This implies that if we are to attempt to use quantitative data to capture ‘left behindedness’, once the aforementioned demographic, educational, socioeconomic and distance-related variables are included, we must consider geographical mobility. Indeed, in a country in which more than 60 per cent of the citizens live within 30 kilometres of where they lived at 14 years old, it is not surprising that “mobility has come to be associated with a bourgeois ‘cosmopolitan’ subjectivity” and a kind of geographical ‘stickiness’ with the rest. The younger, more highly educated and affluent may move away to growing cities to attend university and seek employment; many others will have little option but to remain. Is calling a place ‘left behind’ appropriate? If a person or place is ‘left behind’, it must be left behind from something – in this case, from cosmopolitanism and the associated progress of larger, more educated, affluent and ethnically diverse cities, to which apparently every place is on a linear path to become more like. In order to progress, Clacton has to become more like Cambridge, Oldham more like Brighton and everywhere more like London. The problem is that, if the UK retains an economic system that is so dependent on London, this might be true. Furthermore, in many deindustrialised towns and cities, whether through government policy, over-reliance on one declining industry, or perhaps failure to specialise, there is limited socio-economic development in a globalised, deindustrialised and service-led economic structure. If referring to them as economically left behind draws attention to, and encourages solutions for this plight, then it would seem suitable. However, I would suggest avoiding any reference to a left behind political outlook as it necessitates a wholly subjective judgement by the researcher who should instead seek to identify the conditions that have given rise to these attitudes. The educated left cannot continue to berate the “idiots” that voted for Brexit without acknowledging the educational, economic and cultural inequalities that have created their own privileged positions and the resentment of others. Categorising a place solely on the economic or geographical analyses of academics, politicians or journalists is still not wholly appropriate as it risks condemning the future of residents who live there based on our notions of what their reality is. Lisa Nandy, Labour MP, argues that this term does not resonate with many people in places like Wigan, her largely working-class Greater Manchester constituency, because they “aren’t wastelands where people have nothing left to lose and dream of escaping to the cities”. Instead, they have a “sense of community, stability and quality of life”, such that people make a choice to move or remain there even if mainstream politics has failed to grasp and even ridiculed these values. 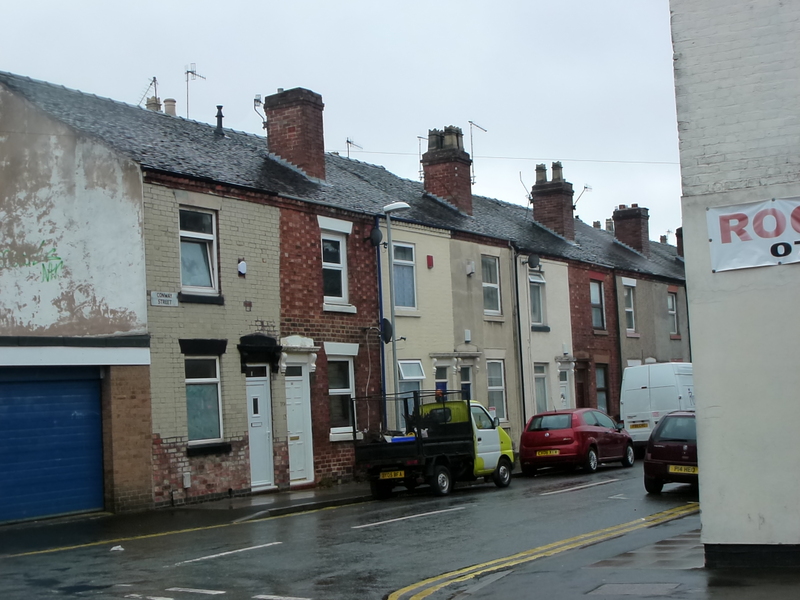 To argue that it is solely these places that are left behind also serves to conceal the difficult reality of life for many – particularly ethnic minorities who are disproportionately poor – in highly unequal, cosmopolitan cities – “a daily battle against poverty and hardship, with a front row seat to wealth and opportunity but no share in its advantages”. It is on these grounds that this article calls for more mixed-methods approaches to the study of these places that do not simply identify quantitative and spatial trends, but also give residents an active voice in the resulting narrative. Does anyone fancy joining me for such a project before Theresa May decides to sail us off into the abyss? *Scotland is not considered in this research or the wider narrative about left behind places as a result of every area of the country voting to remain in the EU and UKIP struggling to gain any foothold there. Previous Previous post: What Does a 4Citizen Look Like?